The 502nd Infantry was activated in the midst of the Second World War, on 2 March 1942, at Fort Benning, Georgia, as the 502nd Parachute Infantry. In August 1942, it was assigned to the 101st Airborne Division, and for the next 22 months, the 502nd trained hard, preparing for the 101st's now celebrated "rendezvous with destiny." During the early morning hours of 6 June 1944, paratroopers of the 502nd jumped behind the beaches of Normandy, thus becoming among the first Allied soldiers to land in Europe. As part of the 101st, the 502nd (or "0-Deuce"), participated in the Normandy, Rhineland, Ardennes-Alsace, and Central Europe campaigns. LTC Robert G. Cole led a bayonet charge at Carentan, an act of heroism for which he received the Medal of Honor. At Normandy, the 502nd earned its first Presidential Unit Citation. At Best, Holland, PFC Joe E. Mann displayed the Courage that has become a proud 502nd tradition. A grenade had landed near him, as he and his platoon lay surrounded and under attack. Without hesitation, PFC Mann threw himself on the grenade and sacrificed his own life for the lives of his comrades. For his heroic action, Mann received the Medal of Honor. At Bastogne, BG Anthony C. McAuliffe spoke in the name of all soldiers in the 502nd when he replied "Nuts!" to the German commander who had demanded surrender. For its fighting spirit at Bastogne, the 502nd added a second World War II Presidential Unit Citation to its colors. Division. It was to remain in Vietnam throughout the entire conflict, redeploying only in early 1972, along with the rest of the 101st, to the United States. The Screaming Eagles were one of the last divisions to leave the combat zone. Two more Presidential Unit Citations and four valorous unit awards testify to their distinguished combat record in Vietnam. PFC Milton Lee was one of three 502nd soldiers awarded the Medal of Honor in Vietnam. His acts symbolized the spirit that guided the men of the 502nd throughout the conflict. On 26 April 1968, Lee, a radiotelephone Operator with the 3rd Platoon, Company B, 2nd Battalion observed four North Vietnamese soldiers establishing an ambush. He attacked the enemy position, wiped it out, and continued fighting until he fell mortally wounded. 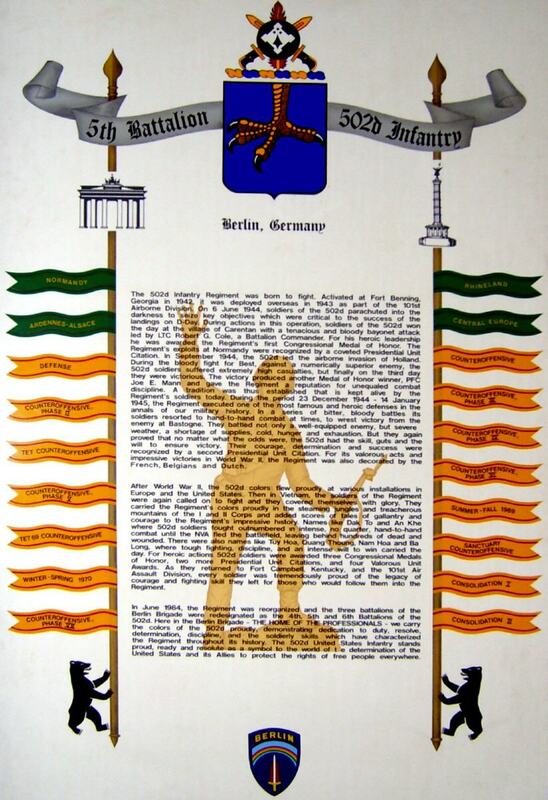 On 29 June 1984, the three American Infantry battalions in West Berlin, Germany were redesignated as the 4th, 5th, and 6th Battalions of the 502nd U.S. Infantry.